WHILE KEEPING MANY TRADITIONS AND CULTURAL ASPECTS. We are gathered here today to celebrate one of life's greatest moments, the joining of two hearts. In this ceremony today we will witness the joining of GROOM/BRIDE and GROOM/BRIDE in marriage. To symbolize the family giving away their child, the groom/bride’s parents will now perform the Brahma Vivaah, the most noble act they will perform in their lifetime. The groom/bride’s mother will now pour holy water into the groom/bride’s father’s palms, which will pour into the groom/bride's palm, and finally into the groom/bride’s palms. This symbolizes the continuity of life and passing the family heritage to the next generation. 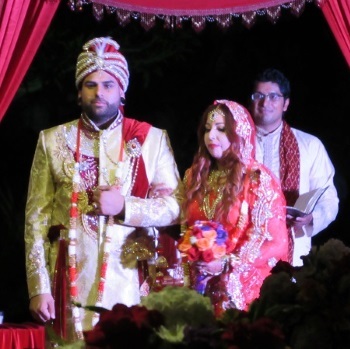 GROOM/BRIDE now symbolizes Lord Vishnu, and as they pour the water, I will recite a verse. Before exchanging rings, GROOM/BRIDE will place the mangalsutra around GROOM/BRIDE’s neck. The mangalsutra represents GROOM/BRIDE being surrounded by love. We will now bless this marriage with one of the holiest of elements, fire, or Agni. This fire represents light, power, and knowledge, and will act as a witness to this ceremony. I will recite a prayer to Lord Agni as the couple place Ghee, a type of clarified butter, in the fire. The Groom/Bride will now move to the left side of the Groom/Bride, indicating her transition into her new family. You may kiss the Groom/Bride.